Pretty quiet trade overnight. Corn, beans, and wheat trading close to unchanged. CFTC will release another week of updated data this afternoon for the last week of December. USDA will release the regular February S&D report this Friday 2/8, as well as delayed January reports. POTUS will give his State of the Union address tonight. Corn export inspections for last week totaled 35.4 mil bushels, off pace from last week. Marketing year total at 884.4 mil bushels. A 612k ton China bean sale was announced yesterday morning. Market expects additional sales announced the next few days. Brazilian bean harvest is estimated at 19% complete, ahead of the 5-year average pace of 10%. CME VSR running average for KWH/K at 41%. An average under 50% of full carry would trigger a storage rate contraction. Soybean export inspections rose slightly week-over-week to 35.9 million bushels (versus 34.7 mbu last week), coming in within the trade estimate range (at 31-48 mbu), but that remained behind the comparable week last year (at 47.9 mbu) - weekly inspections haven't matched last year’s same number all marketing year so far. 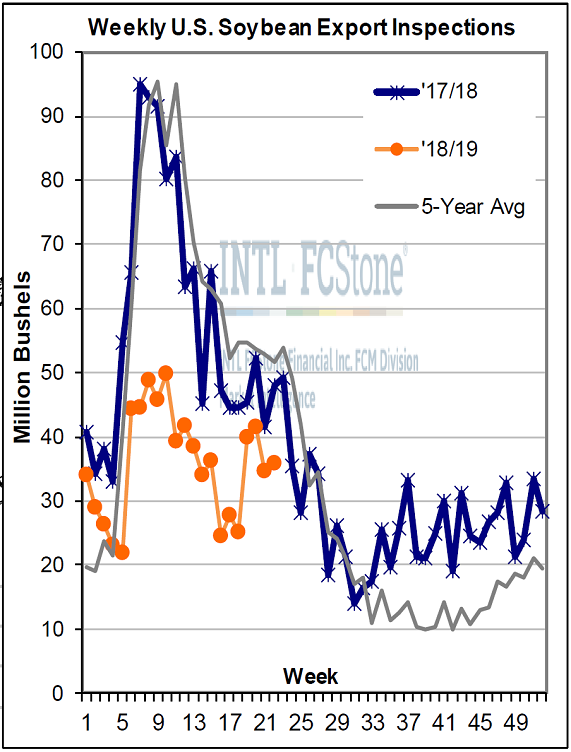 Cumulative inspections stand at 788 mbu, now 488 mbu behind last year’s pace through five months of 2018/19, with the USDA still only at a –229 mbu entire-year soybean export decline.